It was supposed to be the “bridge” between Sudan and South Sudan, a symbol of how two once-warring neighbours can move forward into a new era of peace, a model for amicable problem-solving. Instead, the Abyei area remains mired in a worsening crisis which stands in the way of full rapprochement between Khartoum and Juba. The crisis is one of sovereign identity, and has roots almost a century old. Hopes that it would be settled this month by a referendum are likely to be dashed: few of the necessary preparations are in place and Khartoum is against holding such a vote now. A UN Interim Security Force for Abyei (UNISFA), comprising some 3,881 troops, is deployed there with a mandate that includes demilitarizing the area, averting cross-border incursions, facilitating the delivery of humanitarian aid and protecting civilians threatened with violence. This briefing provides an analytical overview of the impasse. To allow the people of Abyei to decide whether they want the area to retain its current status as a specially-administered zone within Sudan – to whose Kordofan state it was transferred by the Anglo-Egyptian colonials power in 1905 – or be restored to the now independent state of South Sudan. A dispute between Khartoum and Juba over voter eligibility prevented the referendum being held as scheduled in early 2011, when residents of what was then the autonomous region of southern Sudan voted in a separate referendum which paved the way for its secession in July of that year. Most of Abyei’s permanent residents belong to the Ngok Dinka community, which largely supported southern rebels in the 1983-2005 civil war against Khartoum. This conflict was in part sparked by the failure to honour a 1972 peace accord provision that Abyei hold a self-determination referendum. 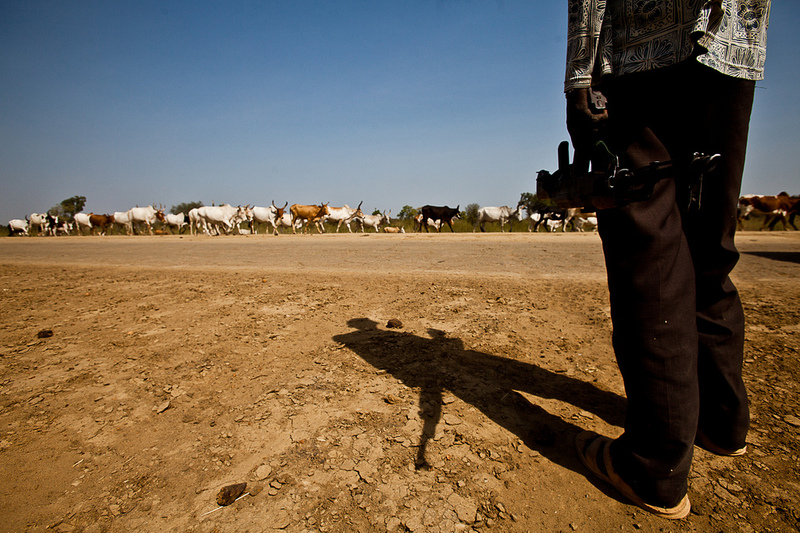 For about six months of every year the Abyei area is also home to around 150,000 migrating pastoralists from Sudan’s Misseriya community (and 1.6 million head of livestock), many of whose members fought in pro-Khartoum militias during the civil war. The Ngok Dinka and South Sudan’s government have opposed efforts by Khartoum to allow the Misseriya to take part in the referendum, saying they are not permanent residents and that the grazing rights they fear will be lost are in fact protected by binding agreements, including the 2005 Comprehensive Peace Accord (CPA) that ended the north-south civil war. “It may also be a short- to medium-term goal to exploit the oil in Abyei for as long as possible, accepting that eventually either the oil will run out or else Abyei will have to be given to South Sudan. Thus Khartoum's policy of delay and procrastination pays a dividend every single day that they manage to keep hold of Abyei,” he added. "Perhaps the most valuable commodity in Abyei now is political capital: neither Juba nor Khartoum can afford to lose what has become a zero-sum game"
In terms of natural resources, water (notably the River Kiir, also known as the Bahr al-Arab), pasture and some arable land are Abyei’s main assets. Perhaps the most valuable commodity there now is political capital: neither Juba nor Khartoum can afford to lose what has become a zero-sum game. For South Sudan, and most Ngok Dinka, Abyei is historically and culturally part of the south, as well as a cause the Juba government uses to unite its disparate peoples. In addition, the Ngok Dinka link their physical security to being part of South Sudan. Their right to hold a referendum is enshrined in the CPA. For his part, Sudanese President Omar al-Bashir, already criticized for having “lost” the south to the “enemy”, is facing widespread social unrest and “determined that no other parts of Sudan are lost on his watch,” said Ashworth. Nor can Bashir afford to antagonize the Misseriya, who have already spoken out against Khartoum’s perceived failure to fully protect their interests. Like most pastoralist groups in the region, the Misseriya tend to carry light weapons. When is the referendum meant to be held? Sometime this month (October 2013), under a Proposal on the Final Status of Abyei made by an African Union (AU) panel (AUHIP) led by South African former president Thabo Mbeki. South Sudan and the AU Peace and Security Council (PSC) back this proposal, under which only “permanent residents” are allowed to vote. Khartoum has not signed up to it, saying that joint administrative institutions should be re-established in Abyei first. This has led to accusations that Khartoum is - yet again - employing delaying tactics to prevent the ballot taking place. The Ngok Dinka have refused to contemplate such a joint administration since the May 2013 killing of their paramount chief, Kuol Deng Kuol, during an ambush by Misseriya militia, while he was travelling under the protection of UNISFA. “An internationally-sanctioned referendum organized by both states [in October 2013] is extremely unlikely. Given the lack of planning, at this stage, it is functionally impossible,” said Akshaya Kumar, a South Sudan/Sudan policy expert at the Enough Project, which recently published a detailed timeline of recent events related to Abyei. Have any referendum preparations been made? In the absence of an agreement over eligibility, there have been no joint preparations for the referendum and a bilateral commission conceived to oversee the process has not been constituted. Neither has a joint police force for Abyei or joint governance structures agreed upon in a 2011 deal. With support from Juba, the Ngok Dinka insist a referendum will be held, with or without Khartoum’s involvement. (See “Risks”, below). To this end, thousands of Ngok Dinka who left their homes after the killing of Kuol Deng Kuol, and around 120,000 who fled when the Sudanese army, backed by Misseriya militia, invaded Abyei two years earlier, have returned home. Voter registration has taken place in some southern areas. South Sudan President Salva Kiir has ordered that people from Abyei should be given time off so as to return to the area and vote in the referendum. Further clashes between the Misseriya and Ngok Dinka are “highly likely” should the unilateral referendum go ahead, according to a recent overview by the Small Arms Survey. “We want the [Khartoum] government to be clear with us… if it fails, we will play our part in the liberation of our land in war and peace," Misseriya paramount chief Mukhtar Babu Nimir said in August. Sudan’s Foreign Minister Ali Karti warned in September that any attempt to impose a unilateral solution could open the "gates of hell". Thousands of Ngok Dinka took to the streets of Abyei in September to protest lack of progress with the referendum. They also called for the withdrawal from the Diffra field of a contingent of Sudanese oil police, whose presence in Abyei violates bilateral agreements. The report went on to note that “Ngok Dinka residents fear that the Government of Sudan and the Misseriya are carrying out a programme of settlement in the northern part of Abyei to change the demographic picture on the ground… either to ensure sufficient Misseriya become eligible to vote so as to sway the referendum results in their favor, or simply to facilitate a de facto partition of Abyei Area. If major hostilities broke out in Abyei, it is uncertain what action UNISFA would take, since its mandate is focused on conflict prevention and facilitating the delivery of humanitarian aid. It does have the authority to use force to protect civilians “under imminent threat of physical violence”. For the Ngok Dinka leaders, as well as some analysts, the AU Peace and Security Council (PSC) needs go beyond its endorsement of the AUHIP proposal and announce a concrete timetable for the referendum. In the light of the PSC’s incapacity to enforce its decisions, there have also been calls for the matter to be passed on to the UN Security Council, and for the Council to declare Abyei a UN protectorate. On 23 August, the Security Council called for an immediate resumption of negotiations on Abyei’s final status. But for the Ngok Dinka, Juba, and others, there is nothing left to negotiate. Everything is clearly laid out in existing agreements, such as the CPA and the AUHIP proposal, which the international community should, rather than “colluding with Khartoum’s evasions”, insist are implemented in full. Failing that, and with the Abyei crisis having been distilled into an apparently intractable referendum dispute, a way out of the impasse is hard to fathom. “This is becoming just a question of mobilizing numbers. No side will want to go to the referendum unless they have more voters than the other, and both will likely try to settle more people into the area, and to get them registered, to turn the balance in their favour,” said Jérôme Tubiana of the International Crisis Group and author of a recent analysis of relations between the two Sudans. “This puts Abyei at risk of becoming an encysted problem like Western Sahara,” he said, adding that crisis-easing options such as power-sharing were almost impossible to invoke now because a referendum had been promised to the Ngok Dinka and even, via the CPA, agreed to by Khartoum. Tubiana called for a broader view of the Abyei crisis. "The real question is whether the border needs to be an ethnic one. Why can't a Dinka be a Sudanese citizen, a Misseriya a South Sudanese? This question goes beyond Abyei area and extends on all parts of the new border. The AU insists on this border being a `soft border’. Now it's time to give substance to this idea, and define which kind of freedoms should be given to the people living on both sides: freedom of movements, of trade, to vote, dual citizenship. "Everything should be open to discussion, and Abyei, rather than the deadlock it is, should be turned into a model for this soft border. These discussions should involve more than just the governments, but engage the border communities, including the Ngok Dinka and the Misseriya in Abyei." In a recent report, Kush, a Juba-based peace-building NGO, advocated a similar pan-out from the referendum, warning that a mere ballot was unlikely to resolve animosity on the ground. Barely 10 percent of displaced Ngok Dinka surveyed by Kush thought a peaceful resolution of the crisis was likely. Without radical changes to the area’s “security, economy, governance, rule of law, and the overall social wellbeing of the population,” lasting peace will elude Abyei, the report argued.